Are you using UberMenu 3? This is the UberMenu 2 article. Please view Will UberMenu 3 work with my theme? Note: For technical people, this means the theme must use the WordPress standard best practice of calling wp_nav_menu with the theme_location parameter. If you don’t know how to check the code of your theme, just follow the instructions below. Navigate to Appearance > Menus. If this option is not available, WP3 Menus are not supported. In the Menus panel, check to see if you have the Manage Locations tab. It will tell you if your theme supports WP3 Menus. 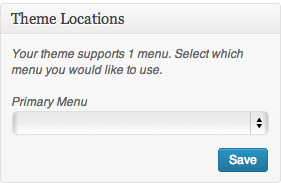 If your Menus Panel has the Manage Locations tab and says Your theme supports x menus (where x > 0), the theme is compatible. Any theme location listed can be turned into an UberMenu if the theme is coded properly. If the theme says Your theme does not natively support menus, then you will need to insert Easy Integration into your theme template to integrate UberMenu, since this theme does not meet the Requirements for automatic menu replacement. Your theme supports 1 menu. Select which menu you would like to use. Your theme supports 0 menus. , so it does not support UberMenu out of the box. You’ll need to use UberMenu Easy Integration with Artisteer. Headway 3.x now uses WordPress 3 Menus, but to remove the residual styling you’ll want to use these special instructions. Suffusion implements a non-standard menu. However, at the last version I tested, the menu can be easily replaced with UberMenu via these integration instructions. I do not recommend use with this theme unless you are comfortable adding a small amount of PHP code to your functions.php. MultiToool Framework The MultiToool framewok does not use theme locations, and does not provide a way to easily include UberMenu Easy Integration. I have not found a good way to integrate UberMenu with this framework.